As retailers have migrated from traditional Brick and Mortar Omnichannel, they have realized the need to develop applications and tools which are usable across all channels. Over the years, silo’ d channel specific development has created an environment where IT organizations are supporting redundant systems and processes. By taking a capability approach to retail, Esri will enable you to focus on what you do rather than how you do it. This allows you to build reusable technology while streamlining development costs and application support models. In addition, location enables key functionality in Business Intelligence and E-commerce by allowing retailers to attribute structured and unstructured data with location, providing a holistic view of customers’ activities online and in the store activities. How does Esri support Assortment Planning? – Providing market analysis to enable retailers to evaluate the demographic, lifestyle and geographic characteristics of a location in order to best identify how a range of products will perform in that location. 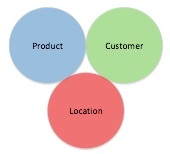 – Understanding the local conditions to explain and predict store performance. Proximity to or from competitors, main roads, highways, public transportation routes, all influence store performance. – Providing the capability to create store clusters, based on selling and geographic characteristics that allow retailers to be more efficient in their planning and distribution activities. – Esri’s platform allows you visualize location data from any source; Esri’s Tapestry Segmentation, AC Neilson Category Data or internal store data across your enterprise in easy to understand maps and tables. 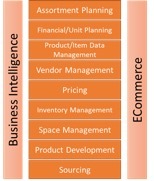 Store Mapping is the process of creating a store merchandise plan at the category level. – Esri’s location tools can utilize your existing store plans to create interactive store maps that can be served up to customers and team members on their devices that interactive experiences like routing a customer through the store while helping them find items and categories. – Using device generated location data to create real time heat maps of customer movement through the store, giving insights a stores more productive space, the effect of in-store marketing or how moving categories affects store traffic. How does Esri support it? The retailers supply chain is at the heart of their operations. Sales and profitability depend on a nimble and dynamic supply chain. Today that supply chain extends beyond the store, directly to customers’ front door. – ArcGIS allows retailers to visualize fixed and moving assets like inventory, transportation networks and stores. Being to visualize this data real time allows decision makers to instantly asses how the supply chain is operating and where issues might be occurring. – Using real time data from externals sources, like weather or traffic, retailers can assess disruptions and build contingency plans to mitigate the impact of a disruptive event. – Traffic and weather can seamlessly be in incorporated in to route planning and home delivery capabilities. This allows retailers to accurately forecast and update delivery windows and provide their customers with consistently great service.